Shibby is on his personal afghan. It’s a common sight at my house but especially now while the Siberian Express is roaring through Canada and leaving frozen car throttles, water pipes, furnaces, etc…in it’s wake. Talk about Cold War! Hoping everyone is tucked in safe and warm at your house. 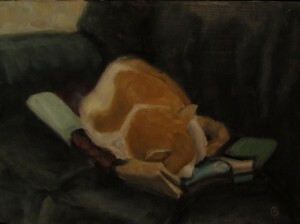 Now I’m just going to curl up with the cat and wait for spring thaw. How about you? 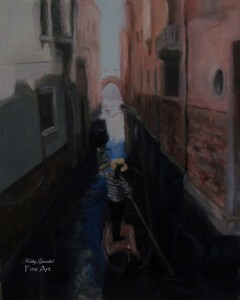 Dreaming of Venice during this cold winter helps to banish the February blahs! While painting this I remember the hot weather of Italy and this lovely moment spent in the cool shade watching the gondolier drift silently along the canal. Feeling warmer yet?